President Mahmoud Ahmadinejad said on Tuesday that Israel has committed war crimes in Gaza which will lead to definite annihilation of the regime- IRNA. 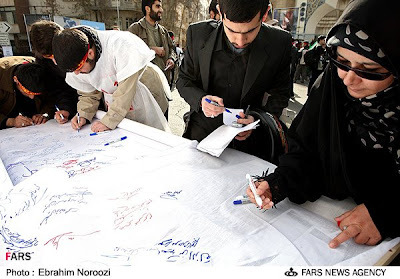 Meanwhile, the Basij students are signing up to be martyred fighting Israel. There’s even a sign up page on the internet! 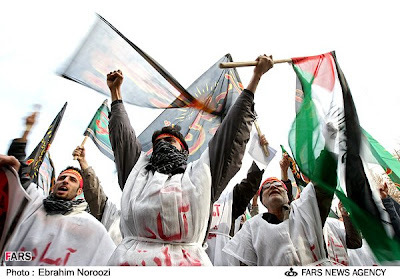 20,000 Iranian students signed up to fight Israel after the Supreme Leader announced that anyone who died fighting Israel would be a martyr. The registration came a day after Iran’s Supreme leader Ayatollah Ali Khamenei issued a religious decree saying whoever dies in fight with Israel and in defense of Gaza would be a martyr. Ayatollah Khamenei’s religious decree was not considered a government decision and did not oblige the government to launch attacks against Israel. 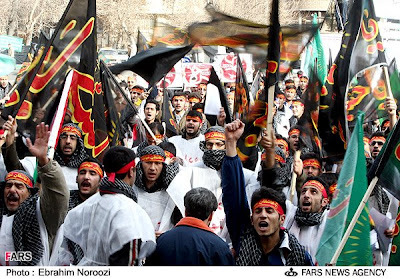 “In response to the Supreme Leader’s decree of Jihad (holy defense),Basij students from all the universities of Iran have registered and the registration will be kept tomorrow,” said Alireza Zahedi, a member of Basij Students of Tehran Universities, without disclosing how many students have already registered. “In the near future, the registered students will hold a meeting to claim their readiness to the Supreme Leader to go to fight in the occupied (Palestinian) territories,” he added. In a similar move, a group of influential conservative Iranian clerics also launched an online registration drive on Monday seeking volunteers to fight against Israel in response to its air assault on the Gaza Strip. About 3,550 people registered Monday with the Combatant Clergy Society’s Web site. The weeklong online campaign gives volunteers three options on ways they can fight Israel: military, financial and propaganda. It looks more like a poster contest.